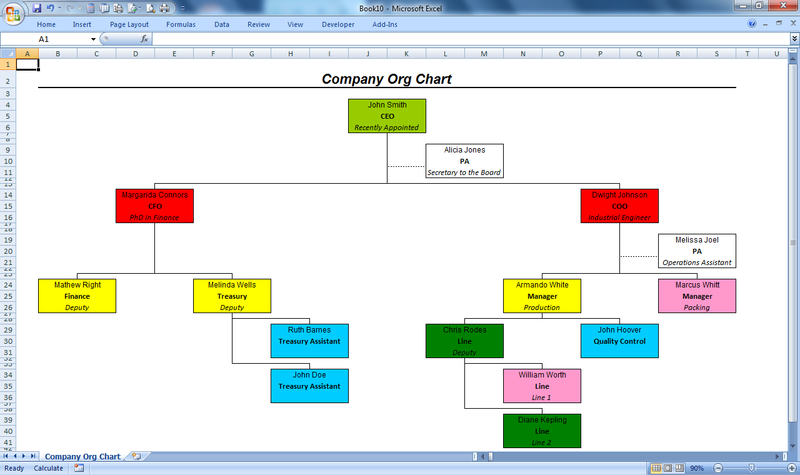 Quickly and easily generate your own organization charts from a plain list of data with Organization Chart Maker for Microsoft® Excel®. Apply colors and formats. Integrate external data from ERP or HR management systems like or Microsoft® Dynamics Navision, SAP®, PeopleSoft®, Oracle®, etc. Chart Stock & Portfolio listings, team members planning & company ownership charts. Runs in Excel, no installation required. Really EASY - if you know Excel, you know this! 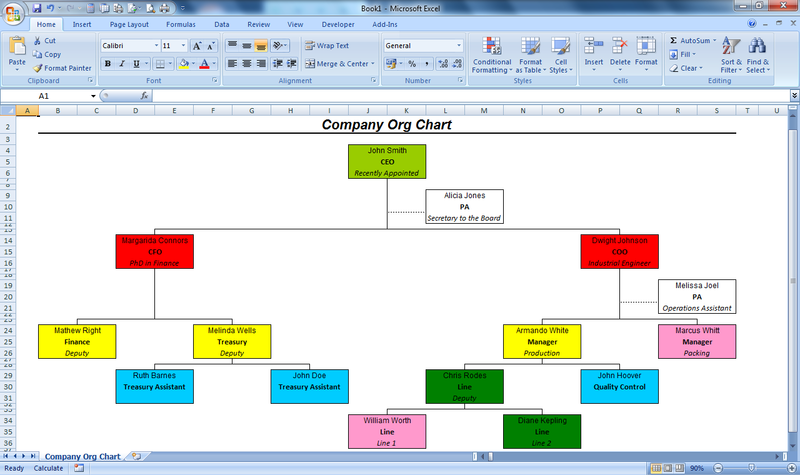 Tired of manually creating your organization charts? Tired of millions of manual updates? If you have Microsoft Excel, you can now generate Organizational Charts, just by entering the hierarchy members and associated data like their name and function. Use different colors and customization options. Import data from external applications like ERP, Accounting or RH packages. 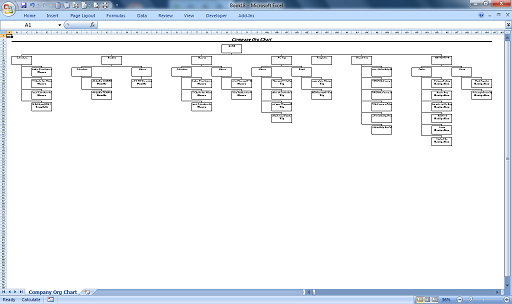 Whole or partial hierarchies from the same data. 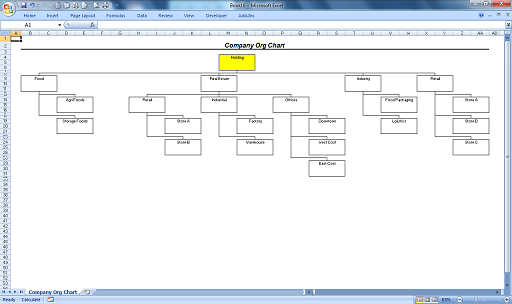 Really easy to use, just fill in the values in the Input Cells (or import them from an external application, like SAP, Oracle, Microsoft Dynamics or any ERP / RH / any management package) and press the "Run" button to create several different styles of Organizational Charts. The system will generate a new workbook with the resulting Org. Charts (PICs. 2 to 5, 7 and 8). This new workbook HAS NO MACROS on it, just the resulting chart. Change, save and email it as any other regular Microsoft Excel file. MULTIPLE uses. 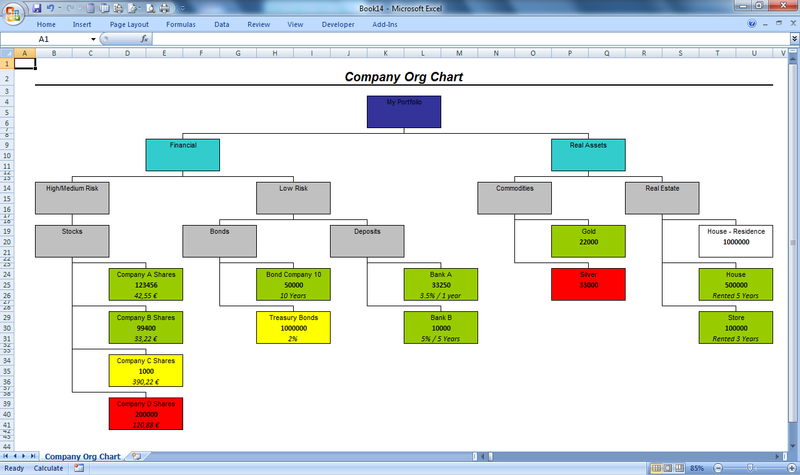 Draw charts for all types of hierarchies! PIC. 2 -Staff Chart – From the whole company to a single department, including company structure, subordinates and assistants. Can represent special purpose details, like Color Maps / Heat Maps for staff performance (Click to Enlarge). IMPORT from external sources. Link to 3rd party software like ERPs, RH suites, line of business, etc! Easily draw Org. Charts with data from external sources like from ERP or HR management systems like Microsoft Dynamics Navision, SAP®, PeopleSoft®, Oracle®, etc. 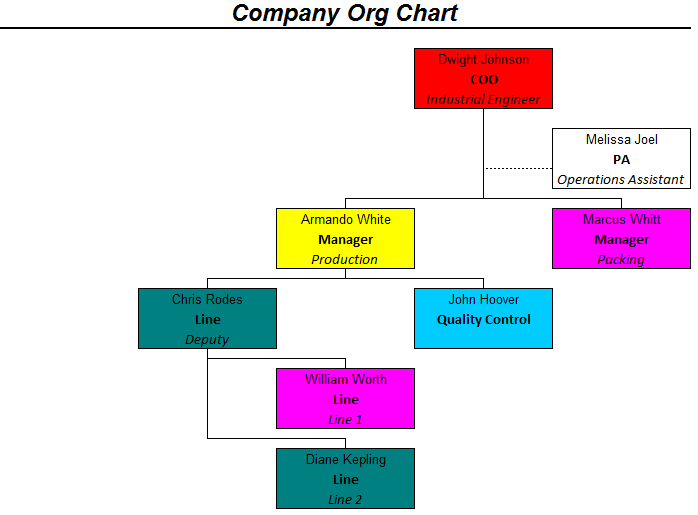 Create a report on the source software (ex: ERP or RH software) that exports a plain text file with the same columns as the "Organization Chart Members List" and load it into Excel. Colors can be applied by name. 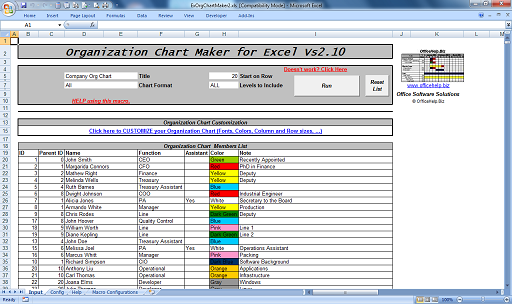 Export the color name in text and the Excel macro will apply the correct color based on your definitions. After payment at PayPal, you will get to a confirmation page with a link to download a ZIP file containing the macro Microsoft Excel file (ExOrgChartMaker2.xls). Click on this link and save the file to your own hard drive. You will need to unzip it (extract the Microsoft Excel files from the compressed ZIP file). Once extracted from the ZIP file, just open them with Microsoft Excel every time you want to use it. The DEMO version of other products can be also included for evaluation purposes. There is a README.TXT tet file on the ZIP with a full description of its contents. Don't wait any more! 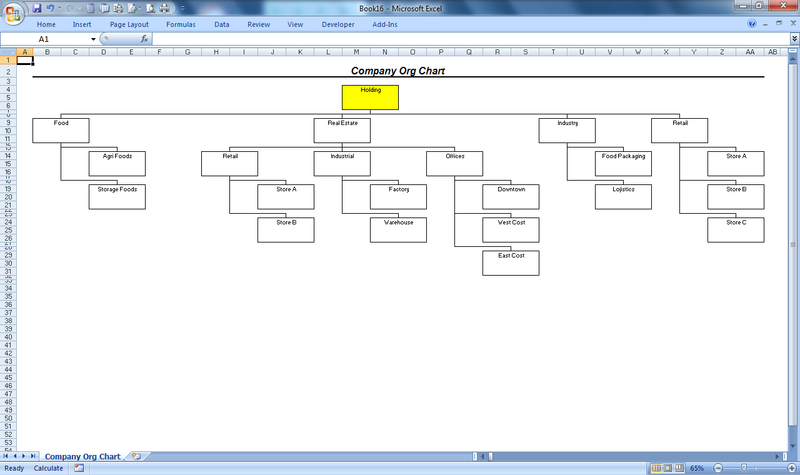 Create YOUR OWN version of the Organization Chart Maker for Microsoft Excel. The Organization Chart Maker for Microsoft Excel allows for multiple customizations of the final Org. 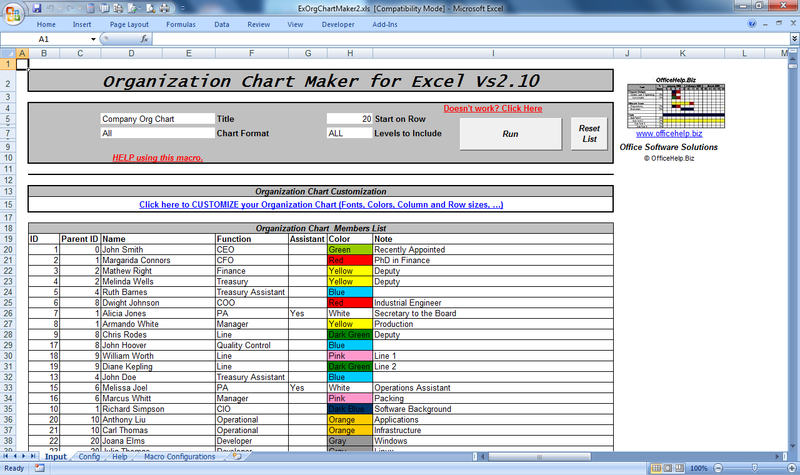 Chart, from simple font and color formatting to chart scope and depth. Subordinates may be defined as Assistants and drawn on a different position that other direct reports: between the Parent and its direct report Subordinates. 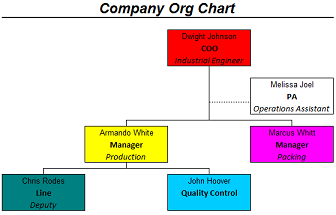 Charts may have multiple scopes (Whole Company / Department) and depths (All subordinates / Only direct reports and their immediate levels) from the same data (members list). Define where the Org. Chart will start and how many levels will be included and only that data will be included from 2 simple options near the Run button. PIC. 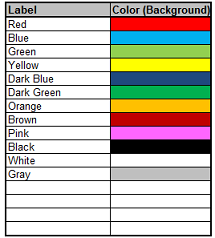 12 – Colors Table - Allow conversion of color labels into colored cells.